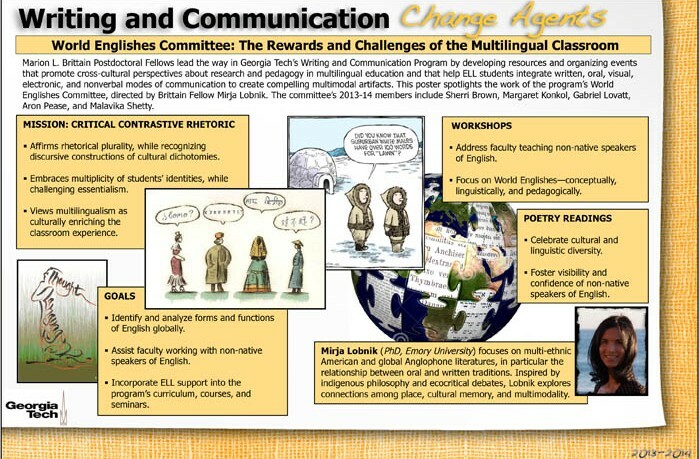 The Writing and Communication Program has several standing committees that Brittain Fellows serve on. Brittain Fellows also elect members to represent them on the LMC Executive Committee and the Writing and Communication Program Committee. 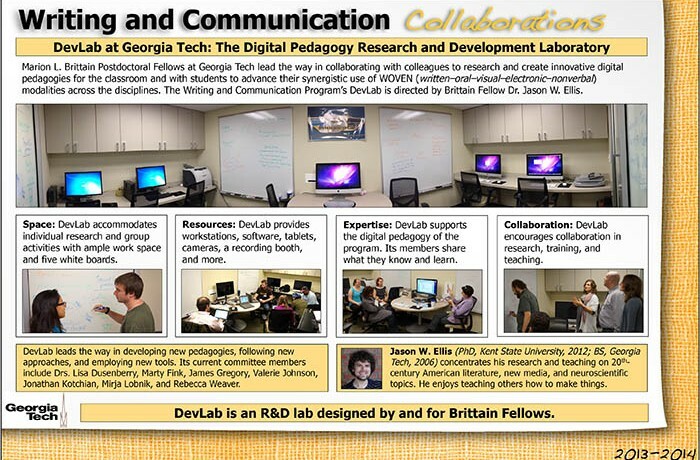 Initiate, develop, and support digital humanities and public humanities-oriented projects in order to increase visibility of scholarship, pedagogy, and engagement of Writing and Communication Program (WCP) faculty within the Georgia Tech campus community and among relevant community partners. Encourage and provide opportunities for pedagogical innovation and professional development for WCP faculty. Enhance STEAM education through multimodal communication. Founded in 2015, the Podcast Committee explores the scholarly and pedagogical possibilities of audio production with three podcasts hosted by TechSTYLE. Flash Readings by the Brittain Fellows is an occasional series that features edited interviews with Fellows as they perform a precise close reading from their current research. 4.33@Tech is a collaboration with librarian Alison Valk and Georgia Tech students; it tells the surprising stories of Georgia Tech's soundscapes. The Office Hour is a weekly real-time chat between Andrew Marzoni, Tobias Wilson-Bates, and guests about the week's newsworthy intellectual debates. Those new to podcasting can learn production by contributing to existing podcasts, then venture out and start their own podcast. The committee also coordinates with the DevLab committee to host podcast workshops for those interested in sound and podcast assignments. The Writing and Communication Program Committee is comprised of representatives elected by the current Brittain Fellows and program leadership, and also the program’s Director, Associate Director, Assistant Director, and Assessment Coordinator. This committee examines and debates issues relevant to Georgia Tech’s Writing and Communication Program. It provides the program administrators with recommendations concerning policies, plans projects, curricular changes, as well as completing tasks vital to the program’s operation and development.